Now, I know that GW has a long history of producing rules that in no way represent the fluff, but this one really gets to me. [The Voidraven's] aerodynamic design and supersonic turn of speed allow it to dance through the sky with balletic grace ... thinking nothing of aerial manouvres that would kill a lesser steersman. Where is my balletic grace? Where are my death-defying aerial manouvres? The one concession they have made to the fluff is the supersonic special rule, which does let it go really fast in a straight line, provided that it doesn't actually want to use any of those expensive weapons hanging under its fuselage. Voidravens are invisible to all but the naked eye and mount complex sonic dampers that completely obscure the sound of its engines. Sensors and early-warning equipment are rendered useless by a stealth warfare suite of such potency that the craft might as well be obscured by dark sorcery. And this is represented in the rules by ... nothing at all, unless you count the option to take night shields. That means that this firing one of these will, on average, hit this flyer 3 times before it can even fire, with half of those hits penetrating and guaranteeing that it will be snap shots only for that opening barrage. But maybe that's supposed to represent plucky Guardsman Jones using his naked eye to take on this supersonic bomber Beat that for "forging a narrative". There's always been that issue of getting the game play and story to gel up in 40k. All I can suggest is that maybe it should have had Vector Dancer. IMO should be strafing run on razorwings and shrouded on the Voidraven. Razorwings are brazen craft specifically designed to terrify the foe with their screaming approach. Their pilots delight in executing murderous strafing runs and watching the panicked survivors scatter for cover. With the option of night shields and shrouded on the Voidraven, plus jink - that would be to op wouldn't it? I will +1 all that. It would make sense for the kin to have vector dancer and probably more so then the hunters to show the fluff saying how agile they are, hmph! At this rate I'm going to have get a job at GW, work my way to the top and try to save the company from itself! And for this I pay how much per book??? Unless you like full colour...too much? I reckon that with access to the forge, we alone on this site could save the game. YEP! That's getting pretty common though, while the internet did a lot of wonderful things it seriously devalued content while also increasing demand. Most publishers of all stripes are having to tighten the belts and cut corners to stay in business. Back when WotC had the Star Wars License it was asked on the Order 66 Podcast if WotC could save money and reduce prices on it's Star Wars Saga Edition RPG by switching to paperback instead of hardback supplements. The response (from Rodney Thompson IIRC) gave on the show was that the production cost difference between paperback and hardback was pennys, so there was no cost savings to pass on, or real reason to go paperback. 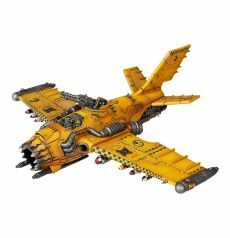 I know it's not GW, but I'll bet the shop at the same store so to speak. So that switch to hardback Codexes cost GW very little, and the price increase is almost pure profit for them. When I hear about stuff like that I try to bare in mind that GW is operating out of expensive to do business in countries (a.k.a, the UK). However, stuff like bragging about how Finecast is cheaper to produce whilst raising the prices is a kick in the teeth. How much of a disaster was Finecast ? A bit behind the curve, I realise, but I just got hold of a back copy of WD#35, the one in which they released the Voidraven. As you might expect, it's full of the same sort of fluff as the rulebook, bearing no relation whatsoever to the gaming rules of the flyer. The Voidravens started on the table, rather than in reserve "to represent the suddenness of the attack." [All DE attacks are supposed to be sudden, so why didn't this particular quirk of VR deployment make it into the Codex?]. This gave each of the flyers at least one extra turn of shooting to do some damage. It would also have protected them from Interceptor, but I don't think any of the AM units had that rule. Meanwhile, the narrative directed that the Imperial reinforcements, consisting of Valkyries (among other things) would not arrive until Turn 3. This kept some of the AM's most effective AA units off the table until the DE had had 3 full turns of wreaking havoc. So, what to make of this? Perhaps the WD team were just forging a narrative in the best traditions of how the game is supposed to be played. [WARNING: Conspiracy Theory] Or perhaps during their test runs they found that the new, all-powerful VR was not actually that impressive on the field of battle, and so had to tweak the rules to make it look better in its launch issue of WD. I'll let the reader decide what you think is more plausible.